Thank you for all your good thoughts yesterday – Holly and I arrived safely (seven whole minutes ahead of the time my GPS predicted) … just in time for Happy Hour 😊. Mother has a List for this visit, but she’s pretty easy going (and we’ve already completed two of the items!). I anticipate I’ll still have plenty of time to knit. My “with wine” project is Colorwash. I actually did a bit of unraveling on it last night (fixing a boo boo I must’ve made this past weekend), but I’m back on track now … and trust I can stay that way. On the book front, I listened to The Book on the Corner on my drive down yesterday and finished it on this morning’s walk. It’s delightful. and all about books and readers with a British accent, a little romance and a happy ending. It’s a nice contrast to In the Garden of Beasts, which I’m reading on my kindle. The book is excellent (this is my first experience with Erik Larson and it certainly won’t be my last), but the subject matter is challenging. Thank you, Kat, for hosting us – love seeing what everyone’s working on and reading! In closing – two views from this morning’s walk – just to give you a flavor of the local scenery. 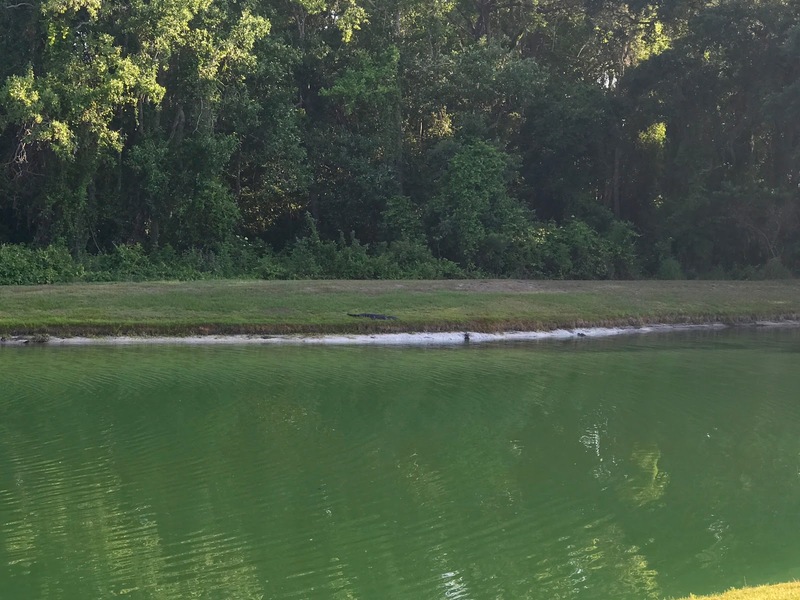 yes, that’s an alligator on the “far” shore! We both had alligator pictures on our blogs today! Enjoy your knitting and great timing on your arrival! I have that audio book on my For Later list. Your with coffee knitting looks lovely. eeek a gator. I have to say I have not seen one at all in my visits to Leesburg. The yarn for both projects is gorgeous! I loved Larson's Devil in the White City. I listened to it and enjoyed the narrator. Will have to check these 2 recommendations. Perfect arrival time! Your knitting looks gorgeous. Thanks for the book recommendations. Keep a tight hold on Holly with gators around!! Great that you and Holly made it safely and have already knocked out at least two – no doubt more as you are reading this – items on your mom's list. 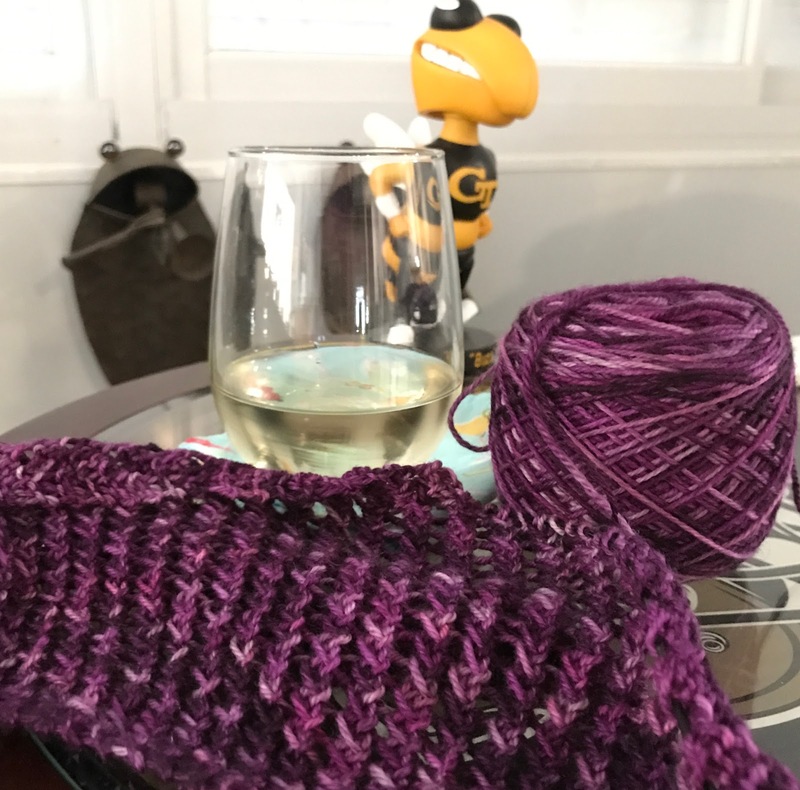 Lovely knitting and I also enjoy the fact that you have specific projects that go with your particular drinks…fun idea. Knit and Read on..think I'll cue Book on the Corner…need an easy listen-to. Enjoy the visit and watch out for gators. Ooh, I love the greens in that watercolor photo! Have a great visit!! I'm glad your trip went well. I envy you being able to visit your mom and do things with her. Enjoy. Oh the colors in all of your photos! So pretty, and such happy colors. Here's hoping the alligator stays put. I always try to beat my GPS (her name is Mandy), and seven minutes is a clear win for you! I love that you have "with wine" and "with coffee" projects and both are lovely. Here's hoping you complete The List quickly and have plenty of time for knitting and visiting! My GPS is Gypsy! I have to say I really enjoyed the bind off on the mystery shawl. It was about 1500 stitches I think but so worth it, I hope you feel the same. And arriving for Happy Hour…perfect! Your Waterlogue photo is excellent! 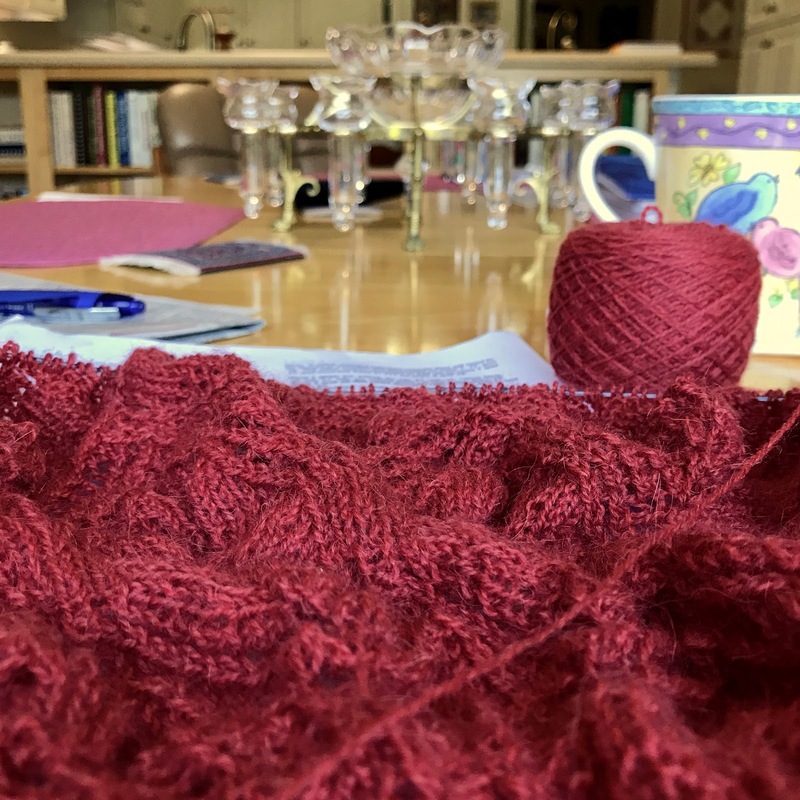 I enjoy my Thistle Rambles shawl and wear it quite often. It will be lovely in that color, too! Glad you're safe in FL! Have a great time! Excellent Waterlogue photo! Wow! And, alligators, oh boy! I am glad it was on the other side! And, nice knitting! May the "list" be done quickly leaving you lots of time to knit!